Jenine, often referred to as Jenny, joined Owens Estate and Wealth Strategies Group in 2018 as a Client Service Associate. She and her husband, Jay, have recently joined forces with the Owens team and will serve clients from our Auburn office located in downtown at 128 East Street. When you call into our Auburn location, you will likely be greeted by Jenny’s friendly voice as she manages all of the day to day operational tasks for that branch. 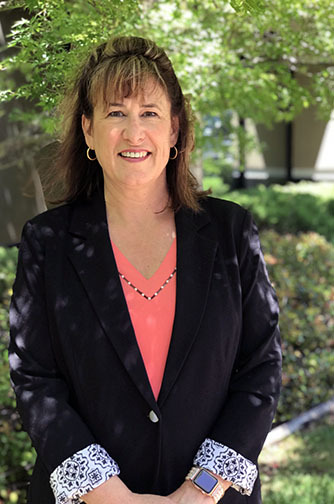 Jenny’s career started in the financial industry at Placer Sierra Bank where she spent fifteen years overseeing six branches as the Operations Manager. Later in her career she worked as the Business Banking Liaison for Roseville Bank of Commerce. After leaving the banking industry Jenny began working alongside her husband Jay at Legato Financial with Raymond James in Roseville, California. Jenny was born and raised in California and grew up in Orangevale and Loomis. She and Jay are proud parents of their two kids, Emily and Dillon. Emily is studying to be an elementary school teacher at Sacramento State and their son, Dillon graduated from Woodcreek High School in 2018. When Jenny is not at work, she and Jay love to travel and especially enjoy going on cruises. She has been quilting for nearly twenty-three years and is very active in the Roseville Quilters Guild.